This is one of those recipes that you won’t want to share. Well, you’ll want to share it because it’s so delicious, but you might find that you want to keep every last little bite for yourself. If you’re sharing, we highly recommend doubling the recipe! Creamy avocadoes act as an incredible replacement for the cream and milk in traditional ice cream, making this 100% dairy free. Besides being dairy free, avocadoes provide an array of nourishing fats from the high level of anti-inflammatory monounsaturated fats they contain. Olives and extra virgin olive oil are also rich in monounsaturated fats, which gives them their reputation of being good for heart health. Avocadoes also contain fiber, potassium, vitamin K and E.
You’ll want to use as much of the darkest green flesh that’s against the peel of the avocado because the phytonutrients are most concentrated in this part of the flesh. Use a spoon to scoop all of this nutrient rich dark green flesh off of the skin. 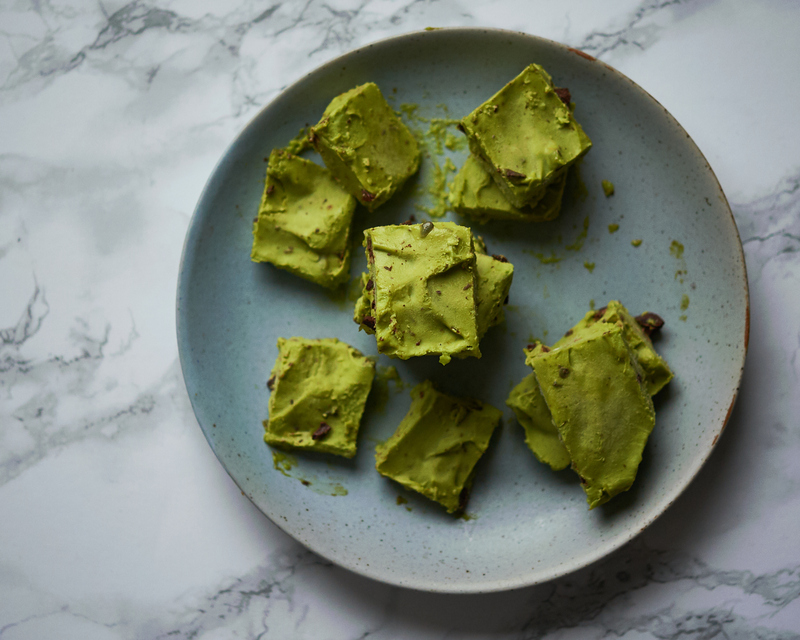 If you are trying to keep your calorie intake up or prevent weight loss due to cancer treatment or any other health condition that’s impacting your ability to maintain your weight, then this avocado ice cream is a perfect addition to your diet. Another wonderful thing about this recipe is that it’s sugar-free. We’ve made this ice cream with monk fruit sweetener or xylitol, which do not impact blood sugar at all. However, if you prefer, you can always sub in another whole food sweetener such as coconut sugar, maple syrup or raw honey. 1. Blend the avocado, coconut oil, milk, sweetener and essential oil in food processor until the mixture is smooth and creamy. You can also use a blender if you don’t have a food processor (it’s just a bit more challenging to scoop out). 2. Once blended, stir in the chocolate chips or chopped chocolate with a spoon. 3. Pour the mixture into a loaf pan that is lined with parchment paper. 4. Place in the freezer for a couple of hours, until firm. 5. Then cut into bars. 6. If you are storing in these in the freezer overnight or for multiple days, it can be helpful to take out a bar a few minutes before you want to eat it, so that it can soften up a bit. Best eaten with a fork!